My name is Lakhvir Singh and I am a proud Uber partner. Prior to becoming an Uber partner, I spent 12 years of my life in Dubai as an electrician. My Dubai journey was an adventurous one as I ended up becoming floor manager from an electrician for the same IT company but the only thing missing was my family. Coming back to India was a conscious choice to spend more time with my wife and children. I have 3 children, a wife, and a father, who’s an ex-serviceman and has served the county for 20 years . The fact that Uber was active in my city made my transfer to India much more easier. I started working with Uber as a driver under an Uber partner. Within 2 months of driving with Uber and gaining sufficient experience , I had the confidence to buy a car and become an Uber partner myself. I have done approximately 11000 trips with Uber and been on trip for more than 120000 kms. I enjoy driving every day as i get to meet and learn from various riders who travel with me. Being an Uber Partner has made it possible for me to see my children grow and spend more time with my family. This was the aim i had in mind while shifting back to India and Uber has made it possible for me to be able to do that. 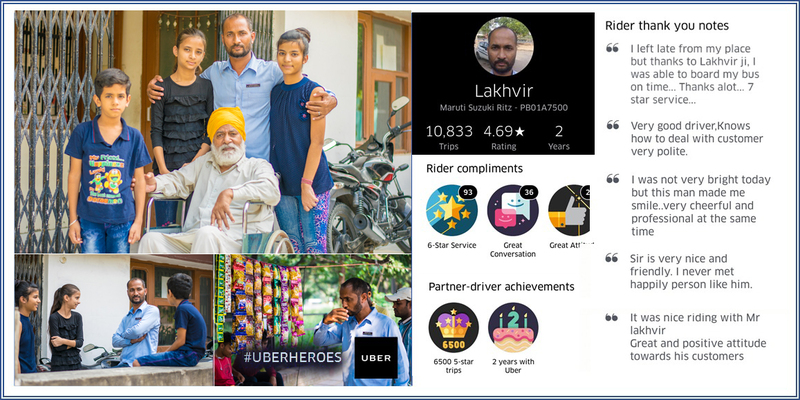 We salute Mr Lakhvir Singh for being an inspiring Uber partner. Watch out for more such amazing stories soon!